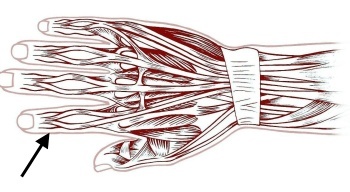 What are the consequences of a separated extensor tendon? What does that actually mean? Doesn´t every digit have just one extensor tendon? Can extensor tendons only be hurt through an external cut? Where is the most common location for an extensor tendon injury? Extensor tendons are at high risk to incur an injury, since they are located close to the surface underneath the skin of the back of the hand and the digits. Therefore even cuts that do not run deep may suffice to cut through an extensor tendon. If the extensor tendon on the back of the hand is injured, the concerned finger (see image – middle finger) can slightly be lifted but not properly stretched out. Please note, that even a wound which appears very small on the outside (red arrow) may lead to a complete severance of a tendon. The malfunction caused by the severance of a tendon may vary quite a bit and depends upon the location of the injury. When looking at this type of injury “only” the distal phalanx of a digit cannot be lifted properly. The other functions associated with the extensor tendon remain uncompromised. These tendons help the hand, the thumb and the other digits to acquire a stretched out position. These extensor tendons run through six tunnels into the thumb and the other digits. A series of smaller muscles can be found between the bones of the metacarpus. Even these smaller muscles have connected tendons which are crucial for the correct stretching out of a digit. No, there are three different causes that will damage an extensor tendon. 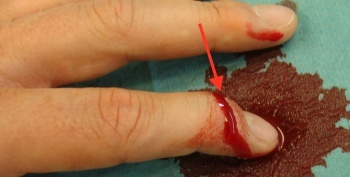 An immediate severance of the extensor tendon, for example caused through a cut. 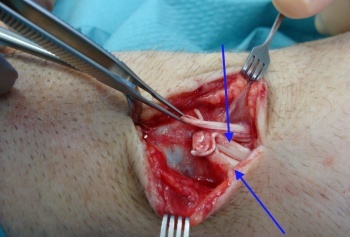 A covered rupture of an extensor tendon right above a distal phalanx. The rupture of extensor tendons along bony edges after fractures or due to introduced screw plates or wires. The open cut of the extensor tendons is by no means the only way of incurring an extensor tendon injury! Extensor tendons may actually get damaged in any location of a finger, the back of the hand, above the wrist or the forearm. The most common location for a rupture on extensor tendons however is right above the distal phalanx of a finger.